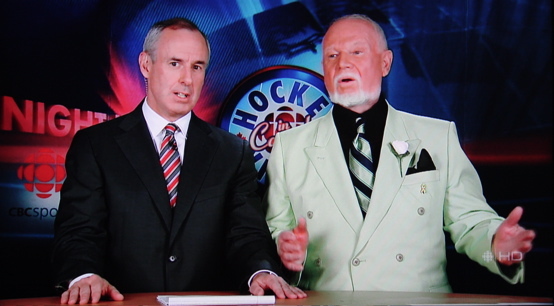 Since I have just learned, using this excellent blog post as a jumping-off point (my own instructions are forthcoming), how to capture HDTV with nothing more than a MacBook, a FireWire cable, and a free (and legal) software download, I present Don Cherry’s jacket du jour straight from HDTV! Also, Don’s tribute to the Vancouver Canucks’ Luc Bourdon, who died on Thursday in a motorcycle crash, was very classy, for a change: Don just shut up and played the video. I’ll post it too when I get a chance. 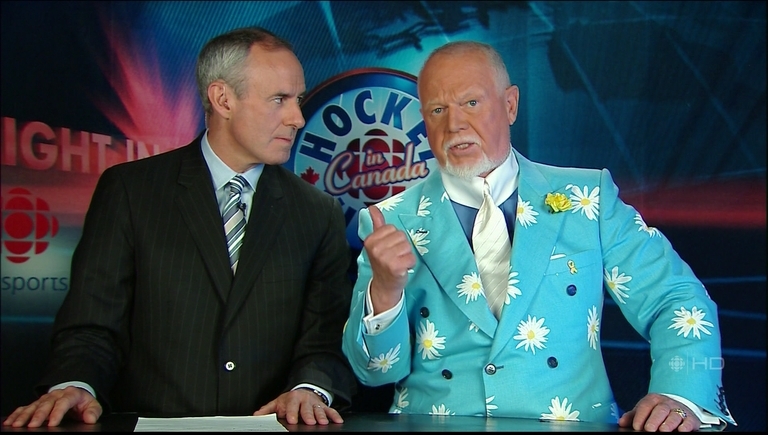 A somewhat muted effect from Don Cherry during yesterday’s Game 2 of the Stanley Cup Finals, possibly in deference to the U.S. Memorial Day holiday. 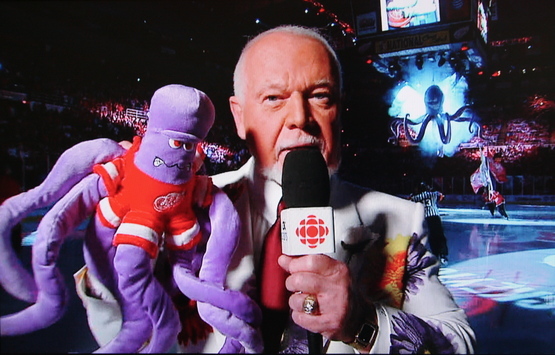 By far not Don Cherry’s worst…at least it helps to contextualize the look of the plush octopus. 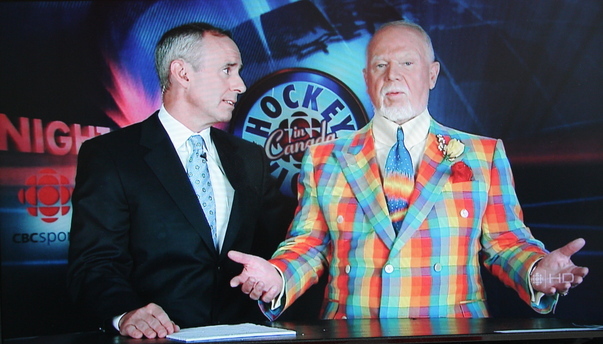 Barring outfit changes, no more Don Cherry posts today. 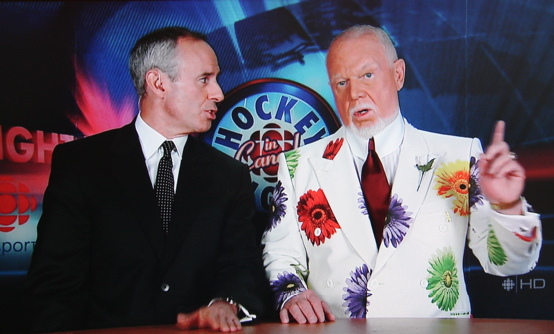 Don Cherry’s flowery jacket is no match for the ohmigod-it’s-so-cute-I-just-want-to-eat-it-up plush octopus the “new NHL” wants them to throw on the ice in Detroit in place of the old, apparently unsafe, kind. But all this notwithstanding, the game was a classic, and congratulations to Russia on an historic gold medal. We’re still #1 going into the 2010 Winter Olympics in Vancouver. 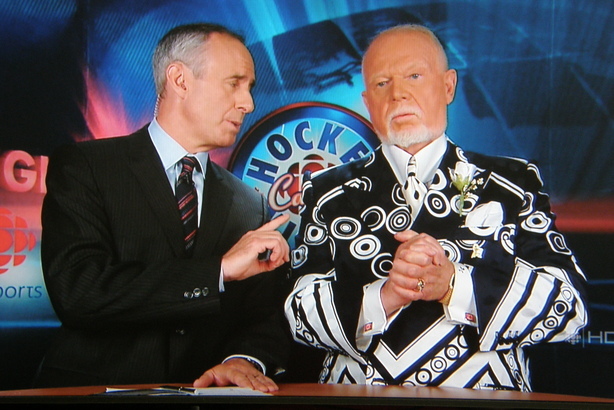 And Don Cherry is still #1 in horrible fashion choices.